Why is it in the form of a question mark? The answer to this question is not to find – this is the idea of ​​the author. He decided that it would be interesting to come up with a seed on question mark 1.2.0, 1.2.6, 1.2.7 and show miners that rivers can be in unusual forms and flow as they please. We recommend that before you put this seed on your card, examine everything that concerns it. We will tell about it now. This place is beautiful because it has a lot of trees, a large forest. Near the forest there are several hills and behind them – a meandering river. 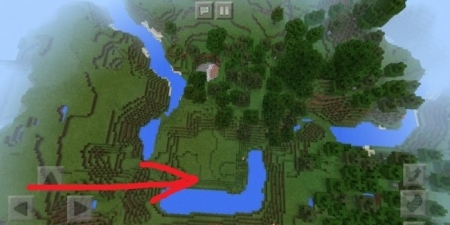 Its course does not flow like many other rivers in Minecraft PE, but in a form very similar to a question mark. What is special about the question mark? The peculiarity of this location is not only in the form of the river and how it flows. In addition, players can find many valuable resources and have fun. Who has the courage and strength, let them go to a large hill, where a couple of trees grow. While somtri on screenshots, valuable chests on the top is not visible, but can rise and looking well, they suddenly show up ?! Since this seed on question mark 1.2.0, 1.2.6, 1.2.7 studied on one of the maps, I want to give a couple of valuable recommendations. Do not walk in the forest for a long time, and study all the mountains and hills very carefully. Do not regret your time and energy, you will be pleasantly rewarded. Before visiting, do not forget to check the version of the game Minecraft Pocket Edition. After you go through the whole biome and learn everything, write in the comments what you managed to find from the valuable (let’s see how many of us are really zealous and goal-oriented).